Cherry blossom season always seems to finish as soon as it starts. In most cases, there’s usually a 4-day window where they’ll come to full bloom, and then just as quickly, the pedals will fall off and green leaves will take its place. 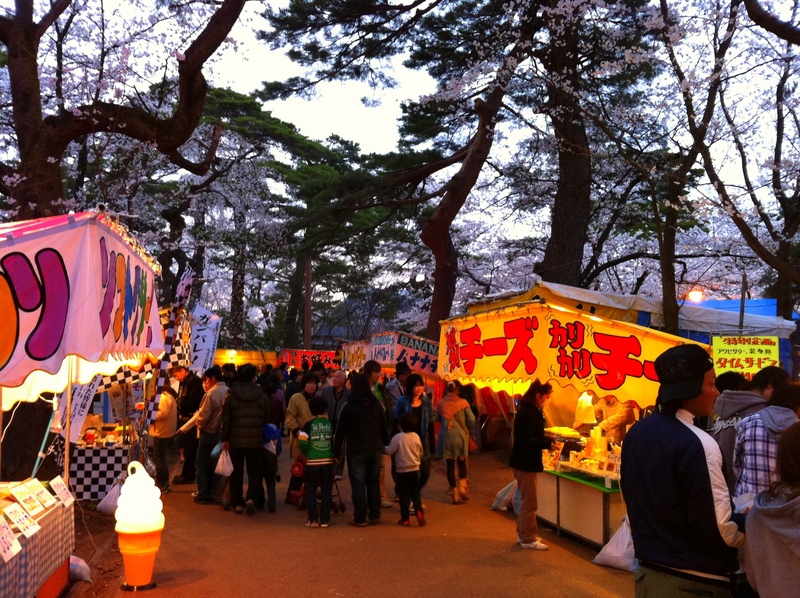 Although the time to go and watch the sakura (cherry blossoms) is short, it’s just enough for most people to escape the office or school and spend the day relaxing under the sakura trees, in an event called hanami. Sakura season is serious business in Japan. 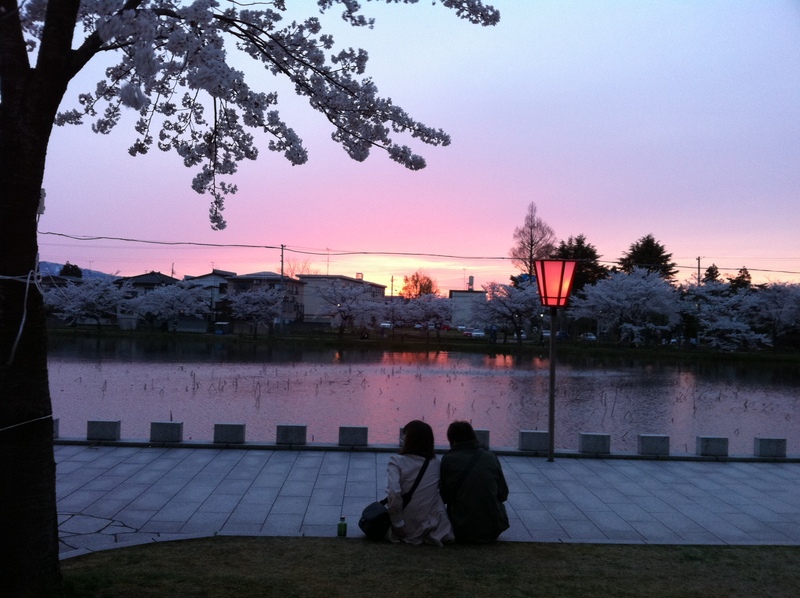 For most people, seeing a sakura tree means the beginning of the school year, or the end of a freezing winter. For this year in particular, it can also mean despite whatever happens, there’s always something beautiful to be found. A sign of hope, if you may. Sakura is SO important, that it’s even on the back of a 100 yen coin! Part two of the Densha de Dan travelogue series brings us to Takada Park in Joetsu City, Niigata Prefecture. 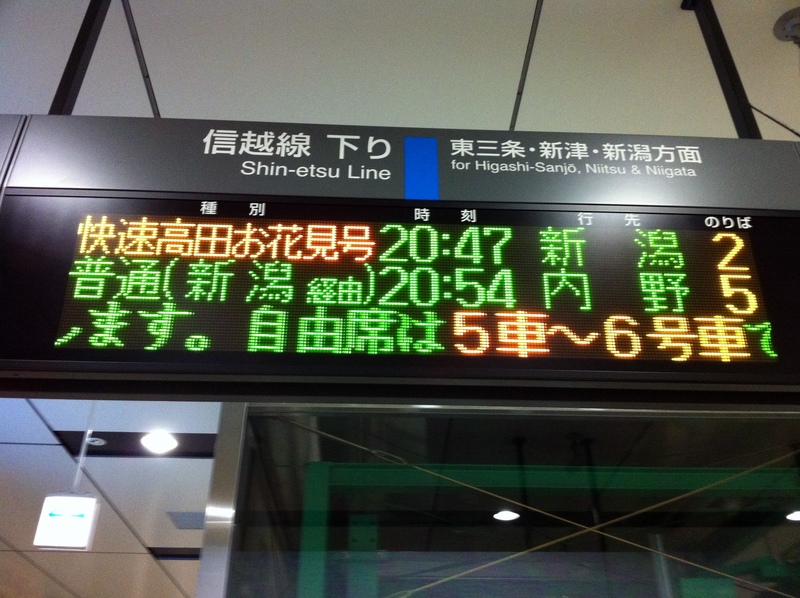 To get there, we’ll be using the Shinetsu-Main Line to get to our destination. The Shinetsu-Main Line runs from Niigata City to Takasaki City, Gunma Prefecture…but it’s probably the least direct route between the two. Also, it doesn’t even connect all the way. For some reason, part of the line has been abandoned and services have been taken over by a private railway company. Maybe it wasn’t profitable? Anyways, the journey from Nagaoka to Joetsu is definitely a scenic one. 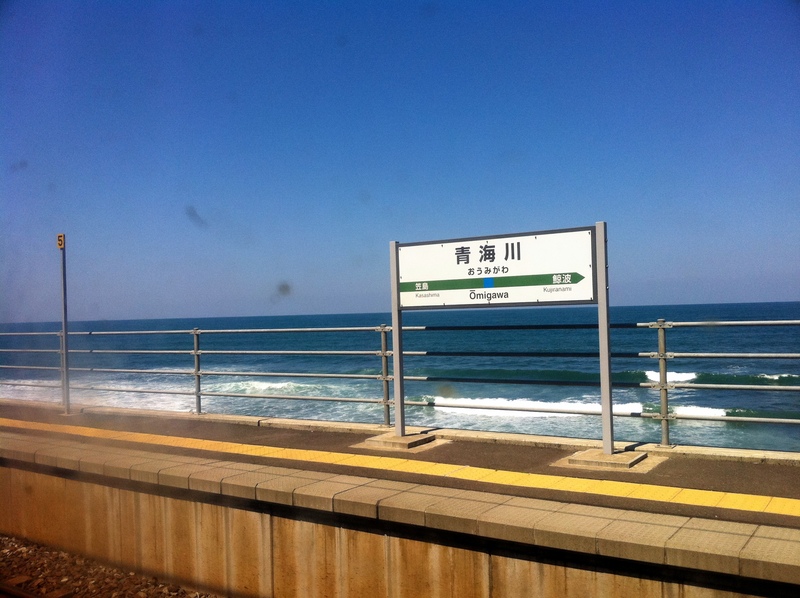 From Nagaoka, the line changes direction towards the coast and as soon as you pass Kashiwazaki City, you’re treated to some really nice views of the sea. Just after you start riding along the coast, you’ll come to Omigawa Station, which is the closest station to the sea than any other station in Japan. The train continues to hug the coast for another 30 minutes or so while passing through a few tunnels. 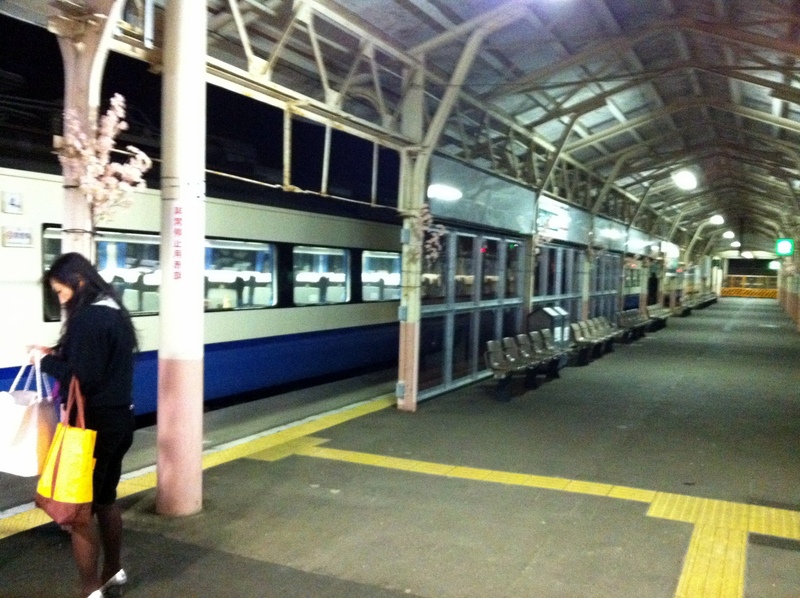 Finally, came our first transfer at Naoetsu Station. 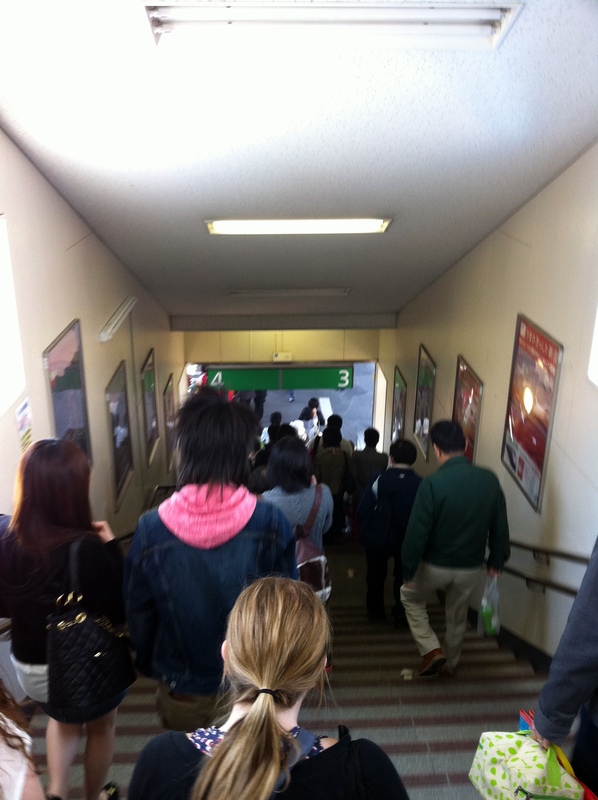 From Naoetsu Station, we continued onward to our final destination, Takada Station. 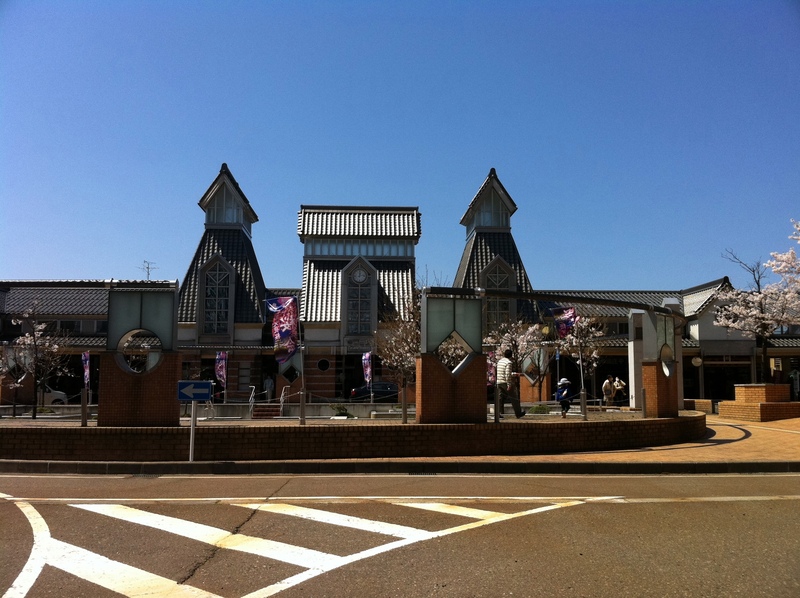 From the station, it’s about a 15-minute walk to Takada Park. On the way, you’ll pass streams and rivers lined with cherry trees, and some people stop to take pictures, but little do they know what’s ahead. After living here for a while, I’ve learned that Japan likes to rank things. But instead of a Top 10 list for things, it’s the Best THREE, and trust me, there’s a list for everything. There’s a list for the Top 3 Hot Springs, the Top 3 Summer Festivals, the Top 3 Places for Ramen, the Top 3 Night Views, the Top 3 Comedians, even the Top 3 Largest Buddhas. Who exactly makes these lists, I’m not sure. Sometimes they can be spot on, other times not so much. 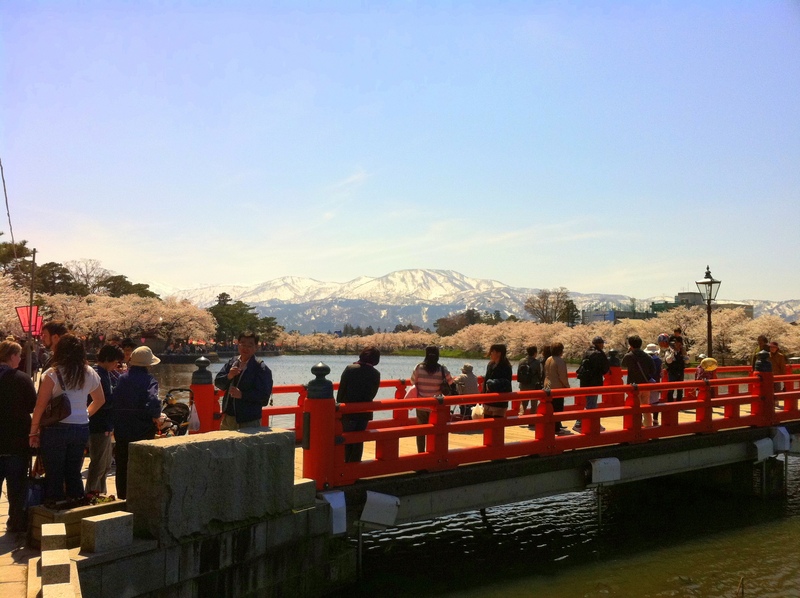 As for Takada Park, it’s considered as one of the Top 3 Best Places to View Sakura. It’s a title it totally deserves. what can make this even better? how about a beer. 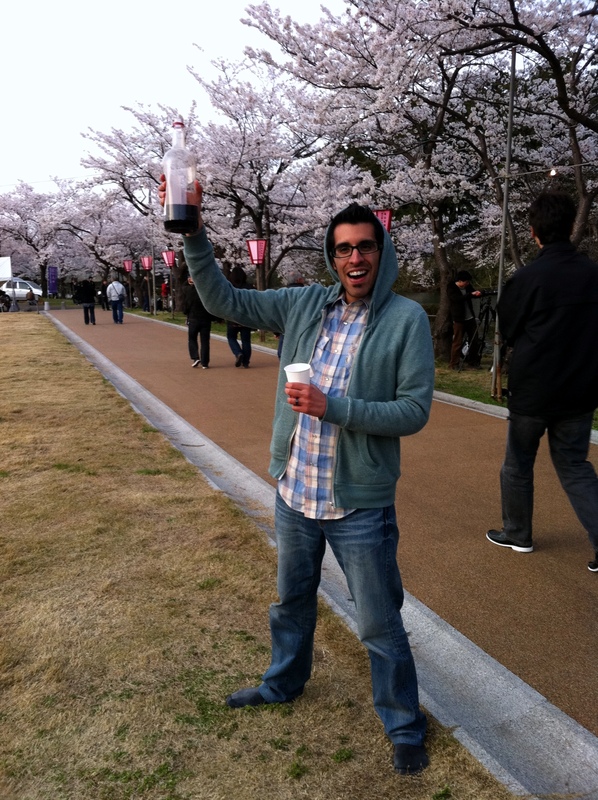 So what do you do at a hanami? 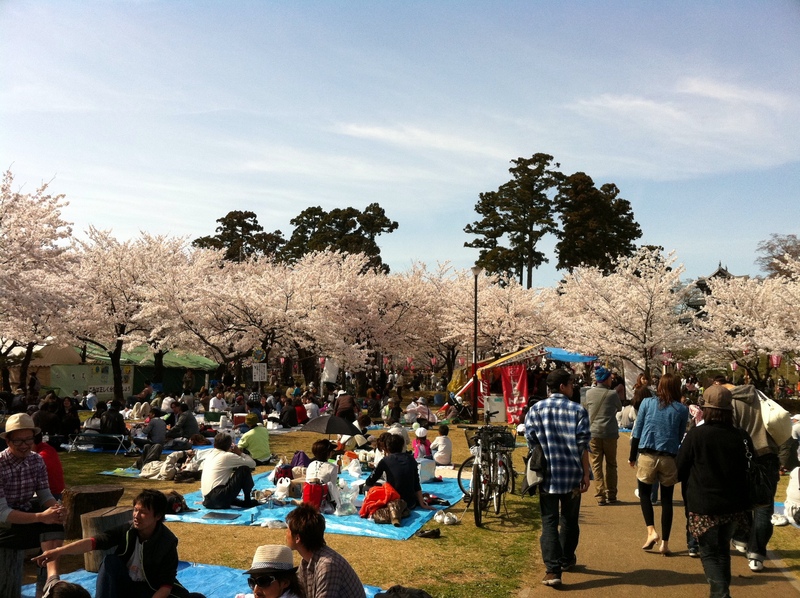 Well, most bring a giant tarp, bring some food and drinks, and simply sit under the sakura for hours on end. For me, it’s the closest thing to having a BBQ at the beach. Mt. Myoko in the background. Great snowboarding in the winter!! This park is huge draw not only to the locals, but people come from far away to visit. I came here last year and I remember it being tough to find a spot to lay down our tarp. This year however, there was still a lot of people, but a noticable difference from the previous. 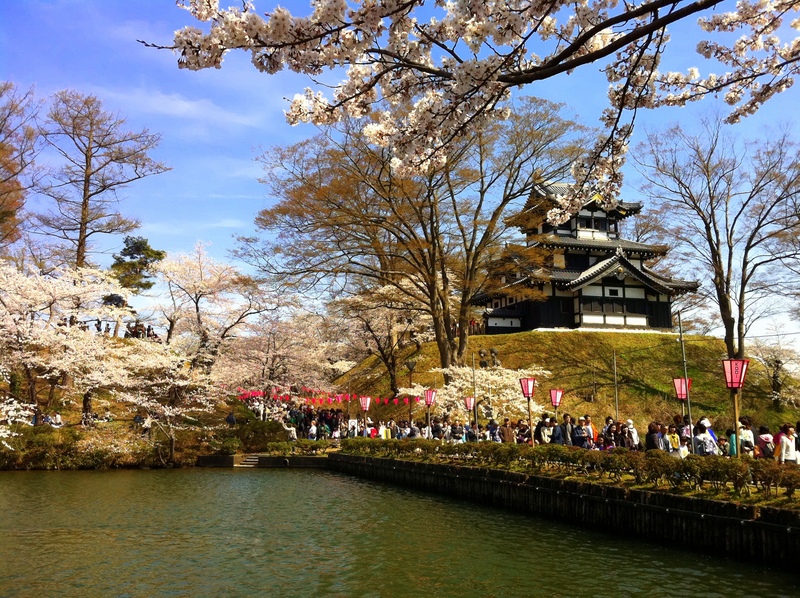 For many, the draw can be the countless sakura trees. Around 4,000 I’ve been told. However, another huge draw (ok, maybe not so much for others, but for me) are the food stands. Like any good festival, there are plenty of places to get your grub on. All in all, there are about 300 different food stands. Amazing, yes. And although you’ll be able to find most of the usual Japanese stall-food fare, like yakisoba (fried noodles), takoyaki (battered octopus), and okonomiyaki (a Japanese-like pancake? ), there’s plenty of other food. How about a meat-wrapped riceball? Or a crepe filled with tuna and pizza sauce? Those willing to stick to the classics will find something to enjoy too, like ice cream, candied apples, and even fried chicken and french fries. Literally, something for everyone. 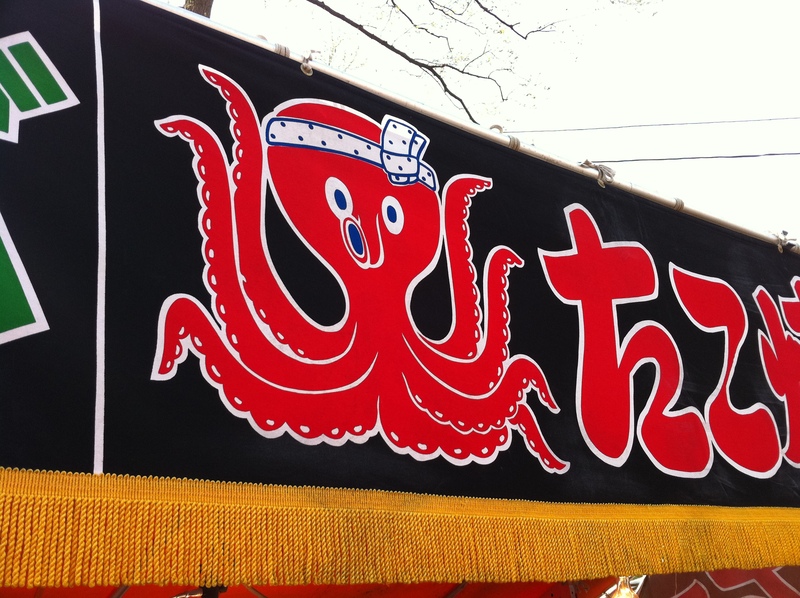 no shortage of octopus here. 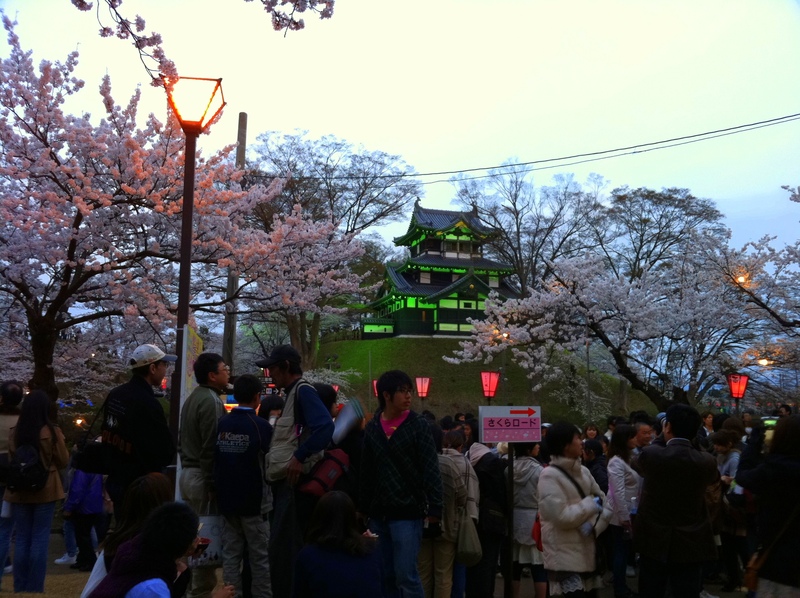 Once sunset starts to hit, lights are illuminated throughout the park bringing out the pink from the sakura trees. It’s also around this time that you realize that you probably should have brought another jacket, as it gets cold…FAST. Finally, it’s time to pack up the tarp, recycle the cans, finish the big plastic bottle of grandpa’s basement wine, and head back home. It’s rare when JR adds additional train services to a route due to a event or something, but SO MANY people come to Takada that they had to create a special rapid train to handle the capacity. 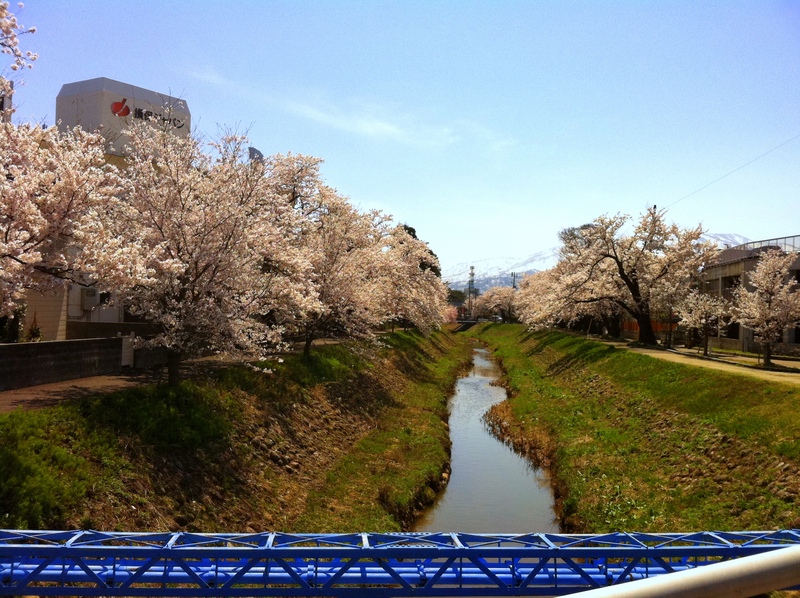 They named this the Takada Hanami Rapid Express. All aboard! its uh, the top one. 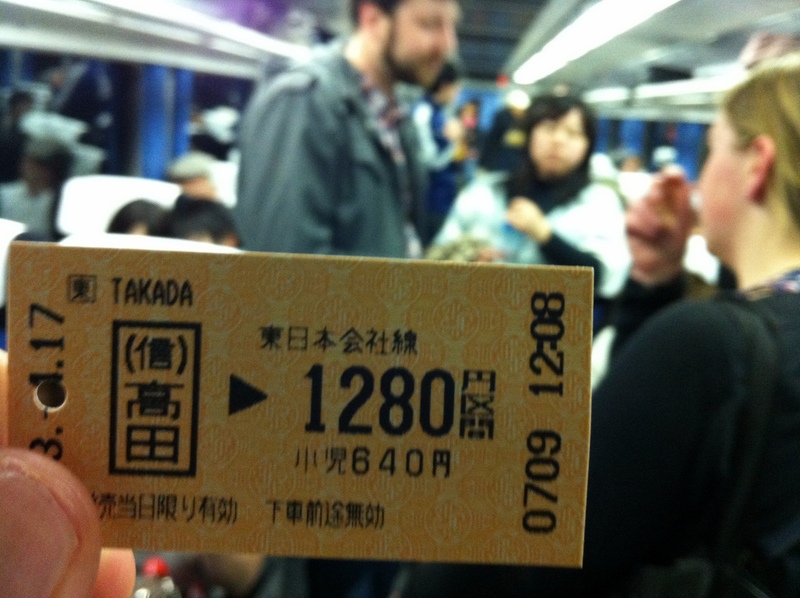 From Nagaoka to Takada, the local train costs ¥1280 and takes a little under two hours. There’s also a limited express that runs between, but the price goes up more than double. Easily adds up when going both ways. With this special rapid train, the cost remains the same, but only takes about an hour and 15 minutes to complete the trip. Also, I found some kids to play rock, scissors, paper with along the way. They grew tired of it and soon evolved into a game show where we were quizzing each other about poop and stuff. They were six. And it helped the time pass. For some reason, I didn’t make it to Takada Park until my 3rd year in Japan. And I’m still kicking myself over that fact. I wish I went sooner!! If you live anywhere in the Kanto/Tohoku/WHEREEVER part of Japan, it’s definitely worth the trip. It’s a shame that sakura can only be seen a couple days out of the year, but as soon as it ends, you’re already looking forward to next years. Luckily, there’s PLENTY to keep me busy until then.